The question of what constitutes “Christian” art or whether there is even such a thing has, within the past thirty years, become a bone of contention in evangelical Christian culture. With the advent of the “culture wars,” there has been an increasingly loud call from some sectors of evangelicalism for Christian’s to “take back” popular culture by creating explicitly Christian art. Films like Left Behind, Fireproof, and most recently Courageous have all attempted to insert a Christian voice into the public sphere. However, this debate over “Christian” art is of relatively recent date. For centuries there was no clear divide between art and faith and, in some traditions (like Catholicism) this continues to be the case. It was not really until the early twentieth century that artists began to conceive of themselves as un-religious, (think James Joyce) though they nevertheless continue to produce art that substantively explored Christian themes. Simply put until the 1980’s very few people saw the need to differentiate “Christian” and “secular” art – art was simply an accurate reflection of reality or it was not – the only thing that changed was that evangelical Christians were particularly bad at recognizing this fact. Simultaneous with the rise of modernism in the early twentieth century, however, was the work of two of the century’s most pre-eminent Christian artists: T.S. Eliot and C.S. Lewis. Both men were members of the Church of England and, though often at odds with each other, both strove to articulate and practice a cohesive vision of what Christian art should be. They also address, in their own unique ways, important moral and literary questions that are still being discussed today, and I think their examinations of the issues remain valuable as we seek to open up a modern dialogue on the subject. In this particular study I want to focus first of all on examining how both these men conceived of the connection between faith and art, secondly, on what this means for Christian artistic theory today, and finally on the way forward to a greater dialogue between faith and art. Eliot understood that poetry and belief do not operate in a vacuum, that they both influence each other and, as a new Christian, he was going to seek out ways in which the two could engage in dialogue. What he realized was that the poet’s task is not solely an individual or aesthetic one, but also a social and moral one. In 1932 and 1933, Eliot gave a series of lectures that tremendously illuminate the direction of his thinking on these subjects. The most important of these lectures, for our purposes were the Page-Barbour lectures at the University of Virginia (published as After Strange Gods) (Hynes 76). In After Strange Gods: A Primer in Modern Heresy, Eliot goes further than ever before in conflating Christian ideas and morals with poetry and criticism. The key words that he employs here to talk about poetry are religious ones: tradition, orthodoxy, heresy and, though he goes to great pains to make it clear that he does not intend to impart all of the religious meaning behind these words to the topic of literature, it is oftentimes difficult to draw a distinction. Predictably, tradition is the term that he starts with, though he uses this opportunity to refashion his definition of it. Indeed, Eliot frames these lectures as a re-visioning of “Tradition and the Individual Talent,” arguing that he cannot now treat problem of tradition and literature “as a purely literary one” (After Strange Gods 15). 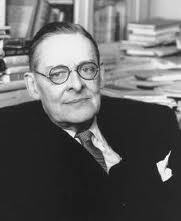 Thus, while Eliot still holds to the basic concepts of literary tradition that he formulated previously, he gives tradition a far broader definition now, arguing that tradition now cannot be simply understood in its literary sense, but as the felt experience of a culture which the poet then expresses (After Strange Gods 18). But for the post-conversion Eliot, tradition is no longer enough, “it must be perpetually criticized and brought up to date under the supervision of what I call orthodoxy” (After Strange Gods 67). Primarily, however, orthodoxy is used as a contrast to heresy, which here is constructed as something committed by those artists who incorporate individualistic and morally dishonest ideas into their work. One could argue that what is heretical is simply what Eliot dislikes, and there may be some truth in this, but in the second and third lectures in the series Eliot goes further, defining heresy in moral terms and providing examples from modern literature of what he means by heretical art. Eliot’s primary example of the artist as heretic is D.H. Lawrence. He compares a Lawrence short story, The Shadow in the Rose Garden, with Bliss by Katherine Mansfield, and The Dead, by Joyce. The conclusion he comes to is that the moral implication of Bliss is negligible (38) and that Joyce is the most orthodox in his complex portrayal of good and evil in marriage. Lawrence, on the other hand, Eliot condemns as a heretic due to “the absence of any social or moral sense,” (39) in the portrayal of the husband and wife in the story. Thus Eliot is primarily concerned, not “with the authors’ beliefs, but with orthodoxy of sensibility and with the sense of tradition…” (40). For Eliot, Lawrence’s story operates outside of social and moral reality, a sense of good and evil, Original Sin. And it is this sense of Original Sin and an absolute morality that he finds disturbingly absent in modern literature, arguing that “with the disappearance of the idea of intense moral struggle, the human beings presented to us both in poetry and in prose fiction today, and more patently among the serious writers than in the underworld of letters, tend to become less and less real” (45-46). This does not mean that there is no place for the portrayal of evil in literature. What Eliot really objects to is the portrayal of absolute evil absent any sort of redemption. Eliot conceives of this kind of artist as dishonest and self-deluded in that, not only is he or she not orthodox, but he or she also has no conception what Eliot calls tradition. I really appreciated your analysis! From a Christian worldview, I’ve been wondering how far we take this concept of “absolute morals.” If orthodoxy is a consensus between generations, do we get our sense of morality from our predecessors? More importantly, are we duty bound to the standards of our parents and grandparents?